BROOKLYN - Brooklyn residents are urged to "ring a bell" 13 times at 2 p.m. Wednesday, July 4, to celebrate the nation's 231st birthday. "It can be any kind of a bell," says Robert Buonvino, president of the Friends of Historic New Utrecht, based at the New Utrecht Reformed Church in Bensonhurst. "Church bells, bells in public buildings and towers throughout Brooklyn, even little bells rung by residents outside their homes," he added, "all showing the pride we have in our nation and how it bridges cultural, ethnic and religious lines." 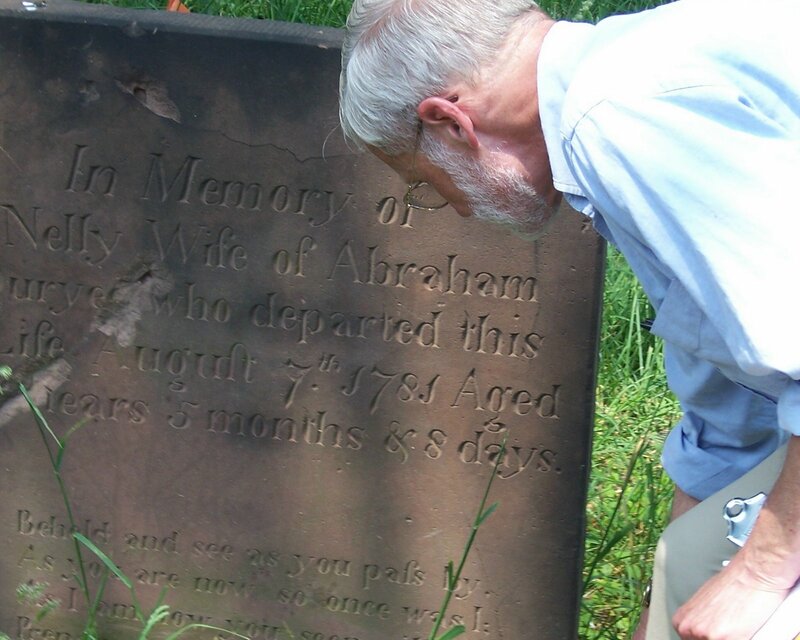 This is the sixth year the non-sectarian, non-profit Friends organization has sounded the call for the Brooklyn bell-ringing to celebrate the Declaration of Independence and to take note of the original 13 colonies. The document was approved by the Second Continental Congress on July 4, 1776, but was not signed until almost a month later. At the Bensonhurst church, a carillon will be played as the church building, which dates from 1828, undergoes a $2 million repair and restoration. "We look forward to when the work is done and the historic bell in the church tower can ring out again," Mr. Buonvino said. 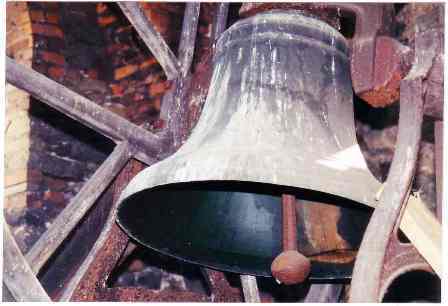 The bell, first installed in the church's original structure, has been rung for centuries at times of the nation's grief and celebrations. They include the end of the Civil War and World Wars I and II, and upon the death of every president since George Washington in 1799. The church, a member of the Reformed Church in America (RCA), was established in New Utrecht in 1677. America's independence also is symbolized by a liberty pole on the church's front lawn. Only the sixth to have been placed on the spot since the evacuation of the British in 1783, it stands 106 feet high with a liberty eagle on top. It's the last of its kind in the nation. Persons interested in learning more about Brooklyn's early history, in the town of New Utrecht, are invited to call 1-718-256-7173 or 1-718-234-9268. They also can log onto the Friends of Historic New Utrecht's Web site at www.historicnewutrecht.org. New Utrecht Reformed Church will not be holding a service on Sunday, July 1; also there will be no service on Sept. 2 (Labor Day Weekend). Please find another church to attend on these Sundays. BROOKLYN - Historian David Elligers' tour of the quiet, old New Utrecht Cemetery at 16th Ave. and 84th St. stopped for a few seconds until he explained to any who might have wondered what they had just heard. "Oh, that's our cannon," he said, calmly. Indeed, the big boom heard in Brooklyn came from a Civil War cannon on the front lawn of the New Utrecht Reformed Church during the 2007 "Liberty Weekend" celebration in which all American veterans and military men and women serving today were honored. 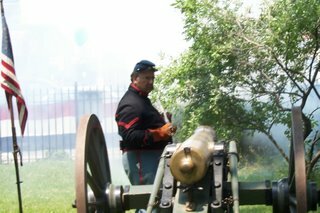 Jeffery Cohen, a re-enactor from Winslow Battery 'D' Artillery, lit the fuse and seconds later was standing in a cloud of smoke. 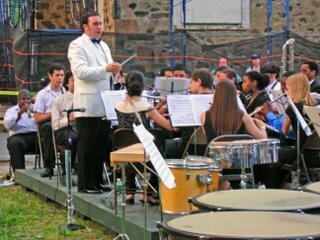 Also on the lawn, at 18th Ave. and 84th St. in Bensonhurst, the InterSchool Orchestra (ISO) Concert Band, conducted by Brian P. Worsdale, entertained. The day before, re-enactors of the famous 14th Brooklyn Regiment, Co. H, camped out near the cannon. Others seen by hundreds of school children included re-enactors of the British navy. Not far away, in front of the church, stands the "Liberty Pole," the sixth to have been erected on that very spot since the British were driven out in 1783. The cannon was fired as part of tours given for fourth- and fifth-graders and later for other students bused in to the historic site for "living American history" lessons. The school children spoke with and asked questions of the "soldiers" from the American Revolution and Civil War. 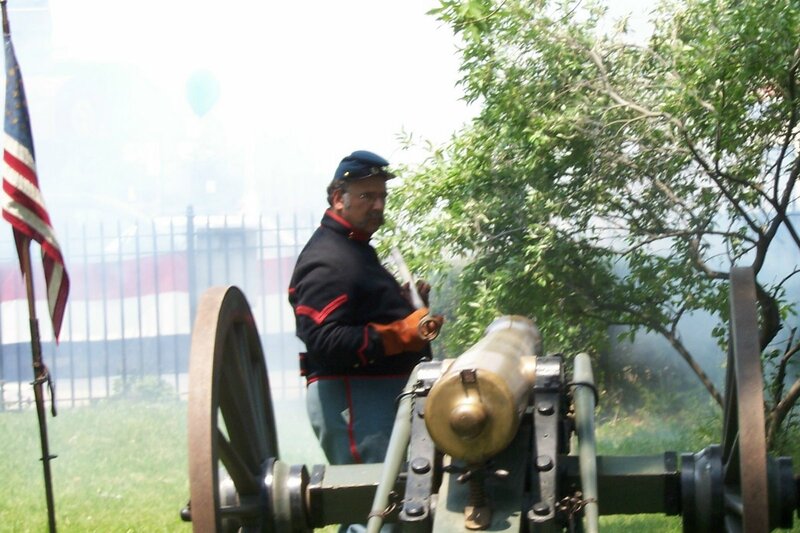 The next day, in addition to the tour of the 1654 New Utrecht Cemetery and the encampment of tents with soldiers in authentic uniforms on the lawn, "Liberty Weekend" gave the general public a chance to examine Civil War memorabilia in the New Utrecht Parish House. 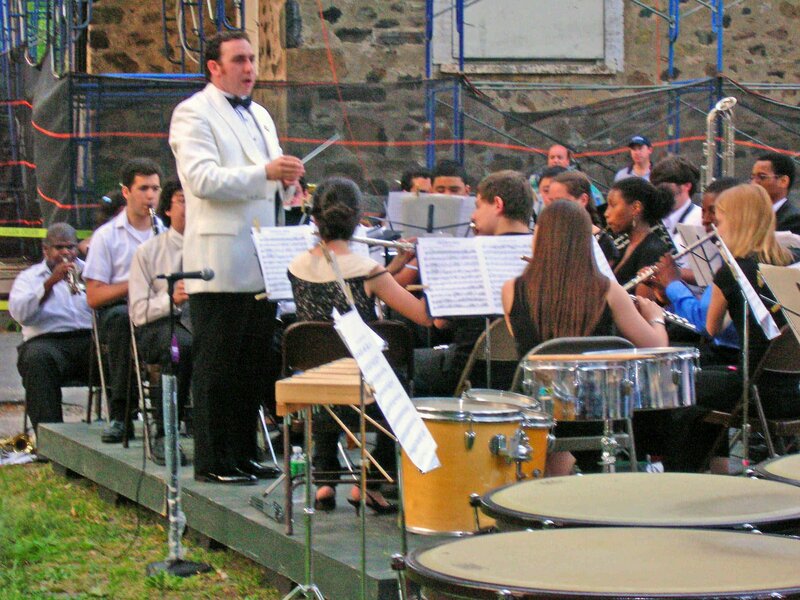 And at night, as passersby and neighbors gathered in the yard of the church complex, the ISO Band gave rousing renditions of the music of bandmaster and composer of marches John Philip Sousa. The final day of "Liberty Weekend" began with an all-faiths service in the Parish House, near the main church building which remains closed for a $2 million repair and restoration. All American veterans as far back as the Revolutionary War were honored, with today's military personnel. An afternoon parade from the church to the cemetery was led by the New Utrecht High School Band. A wreath was placed at the memorial to Revolutionary War Gen. Nathaniel Woodhull, who died of his wounds nearby and is buried on Long Island. "Liberty Weekend" events ended at the "Liberty Pole," where Boy Scouts and re-enactors placed wreaths in honor of all those who have served to defend America's freedom. Speakers included state Sen. Martin Golden, City Councilman Vincent Gentile and Borough Historian Ron Schweiger, who presented a proclamation from Borough President Marty Markowitz on the pole's 224th anniversary. And again, for a final time this year, the cannon was fired. Coordinator of "Liberty Weekend" was Angela Sarro of the local historic organization Friends of Historic New Utrecht. The events were supported, in part, by public funds from the NYC Department of Cultural Affairs, NYC Department of Youth and Community Development and the NYS Office of Parks, Recreation and Historical Preservation. More information about Brooklyn's early history, the village of New Utrecht, is available from the Friends of Historic New Utrecht at 1-718-256-7173 and at www.historicnewutrecht.org or by sending inquiries to mail@historicnewutrecht.org.